Ah, very soon, I’ll be enjoying hours in the garden, growing veggies, flowers and just generally enjoying the outdoors…yeah! This is an example of how mixed media can be very clean and simple. There are different mediums used, but it is indeed a CAS design. 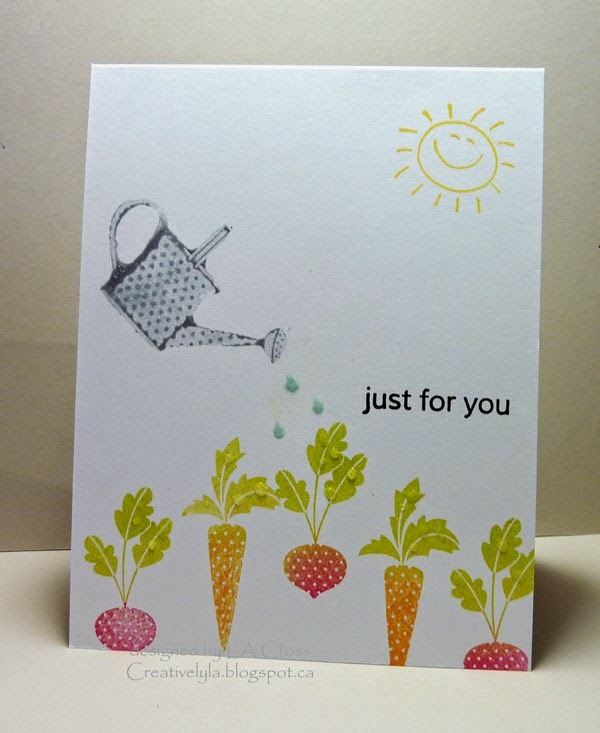 I started out by stamping the veggies along the bottom of the card. Just inked them carefully with two shades of Avery Elle ink. That stuff is just plain awesome to work with! Remember the old pigment inks? Took forever to dry, easily smudged etc.? Well, these are not your mother’s inks *grin*. Next, I used Distress Paint for the watering can. It actually does shine like metal, although the picture really doesn’t do it justice. Then I stamped the little water droplets in another shade of Avery Elle ink and added little bits of Glossy Accents with a toothpick. More water droplets were added to the leaves of the veggies in the same way. Stamped the smiley sun, the sentiment and done! This is adorable! I love that everything is dotted and works so well together! So glad you joined us at CASology this week! The water droplets are very cool. And I love the simple contrast of the “stick man” sun. Here's to sunny weather! That's an adorable scene 🙂 water droplets look so real !! Totally in love with that stamp set and your colors are fantastic!! Like how you did the drops from the watering can too! I use a needle nosed little bottle for my GA and does all kinds of fine work. That sun is the perfect final touch! !